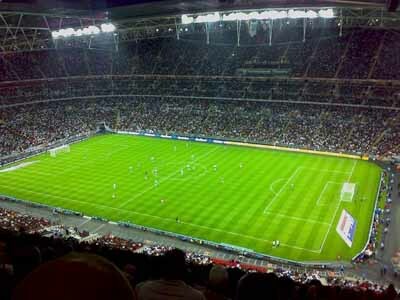 The New Wembley Stadium is considered to be one of the largest football stadiums of the world. The stadium is located at Wembley in London, England. The stadium has been constructed at the place of the old Wembley Stadium . Construction of the new stadium began in 2003, which was scheduled to be completed by 2006. However, the inauguration of the New Wembley Stadium was postponed to 2007. The stadium, with a capacity of 90,000 spectators, is regarded as the second largest stadium of Europe on the basis of capacity.